"Suzanne Simons is a masterful storyteller. 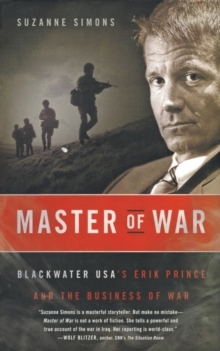 But make no mistake-Master of War is not a work of fiction....A powerful and true account. "-Wolf Blitzer, anchor, CNN's The Situation Room Master of War is the riveting true story of Eric Prince, the ex-Navy SEAL who founded Blackwater and built the world's largest military contractor, privatizing war for client nations around the world. A CNN producer and anchor, Suzanne Simons is the first journalist to get deep inside Blackwater-and, as a result of her unprecedented access, Master of War provides the most complete and revelatory account of the rise of this powerful corporate army and the remarkable entrepreneur who brought it into being, while offering an eye-opening, behind-the-scenes look at the wars in Iraq and Afghanistan.